Political Scientist: Does Diversity Really Work? A study conducted by Harvard political scientist Robert Putnam suggests that diversity hurts civic life and that differences can actually translate into distrust. The political scientist and author explains his findings on the flip-side of cultural diversity. Political Scientist: Does Diversity Really Work? A study conducted by Harvard political scientist Robert Putnam suggests that diversity hurts civic life and that differences can actually translate into distrust. The political scientist and author explains his findings on the flip-side of cultural diversity. Later in the program, she was side-by-side with Cesar Chavez at the founding of the United Farm Workers. At 77, she's still going strong. It's a Wisdom Watch conversation with Dolores Huerta. But first, diversity. It's no secret that the U.S. is becoming more diverse and that's not likely to change. Yesterday we talked about how racial minorities are now the majority in one out of ten counties in the country. And half the country's population could be a member of a so-called minority group by the year 2050. And as we know, people respond to this new America in all kinds of ways. Some argue it's making America stronger. But others worry about America becoming a place they don't recognize, with values they don't share, with no common identity. 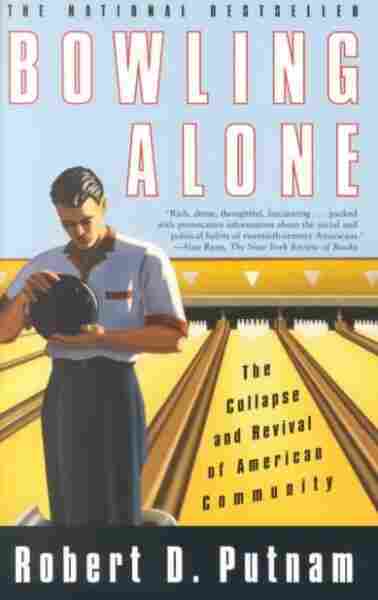 Social scientist Robert Putnam, probably best known for his work "Bowling Alone," on the decline of civic engagement, wanted to know does diversity have an impact on our sense of community? His recent finding suggest that diversity might not make us stronger. In fact, it might just be the opposite. It might make us less inclined to participate in civic life, at least in the short term. Professor Putnam, welcome and thank you so much for speaking with us. Professor ROBERT PUTNAM (Harvard University): Thank you, Michel. I'm looking forward to talking with you. MARTIN: Thank you. Well, thank you for that. And I know you have some complaints about the way your work has been described. I'm going to let you do that in a minute. But first, I wanted to ask you why you thought to study the connection between diversity and civic engagement. Prof. PUTNAM: Well, I've been interested in the questions of our connections with one another for a long time. I sometimes use the jargon of social capital to refer to the connections - our ties with our friends and neighbors and community and institutions and so on. And about seven or eight years ago, at the request of communities all across America - big communities and small communities - we did a very large national survey, trying to measure the level of civic engagement and the number of friends people have and how they got along with their local government and so on, in 40 very different communities, places you've heard of like Los Angeles or Boston or Atlanta or Detroit or Chicago, and places you haven't heard, little rural counties in the South Dakota or up in the Appalachias in West Virginia, or villages in New Hampshire - places all over. MARTIN: I found that fascinating, that it wasn't a question of active hostility. It wasn't a question of sort of people throwing rocks at each other or spray-painting each other's garages, nor was it a matter of everybody, you know, kind of getting together and having, you know, "We are the World" sing-alongs. It was that people tend to withdraw. Why might that be? Prof. PUTNAM: Well, I don't know for sure, actually. It's an interesting puzzle. I think part of it is that when we're around a lot of people who we don't know very well and whose cultural backgrounds and moves we don't know very well, we don't know quite how to read anybody. So we don't know if when somebody looks at us, you know, square on, does that mean hi, glad to have you here, or does that mean get out of my way? And so I think all of us - you know, this is not a matter of liberal or conservative. It's not a matter of old or young or rich or poor. We all, it turns out, seem to be a little defensive. And to pull in, as I say, to hunker down - we have fewer friends. The only two things that go up as the diversity of your census track goes up are protest marches and television watching. MARTIN: Television watching. Oh dear. MARTIN: Is there a silver lining in this for us? MARTIN: I'm sorry. Go ahead. MARTIN: If you're just joining us, we're talking about diversity and civic engagement with Robert Putnam, a political scientist at Harvard University. It sounds to me, Professor Putnam, that you are disappointed in these findings. Is that true? Prof. PUTNAM: Well, I don't know that I'm disappointed in the findings. I'm disappointed that it turns out it takes some time for us to get adjusted to people who look differently from us. And I'm a little disappointed that, as our findings become public, some people - some conservatives, some people who are racist, frankly, have taken comfort from my research. And they've made the inference that if we hunker down in the presence of diversity, it would be just great if we had a little ethnic cleansing and we all just live around people who look like us. That's absolutely not my view. MARTIN: But what if that's true? What if the unhappy fact is true, that people are more likely to go out of their way for people who are more like themselves? Prof. PUTNAM: Well, look, I - what counts as being like yourself is not given by God. These divisions that we draw - these lines that we draw among ourselves are things that change over time. Let me give you a very specific example. I'm doing some work now on religion in America. And in the course of that research on religion in America, which initially didn't have anything to do with diversity, I've been visiting some of these very large mega-churches, like Lakewood, which is a very large church - largest church in America, actually, down at Houston. You know, it meets in a great - a former basketball arena and I went to one of the smaller services. There were I think five or six thousand people there the evening I went to service there. It was the most micro-integrated group I've ever been in in my life. The whole 5,000 people was - it was just a definition of a rainbow. There were - in my pew - well, it wasn't actually a pew, because this was a basketball arena. But in my little area there was a Hispanic couple, and then me, and then a blonde, and then a Korean couple, and then an African-American couple. And everybody was hugging everybody and singing in sonnets. You know, frankly, I'm a kind of a New England intellectual and it wasn't my style of religion. But it was an amazing experience. MARTIN: All that hugging made you want to hunker down, huh? Prof. PUTNAM: No. But what was clear was, these people, even though they were of different races and - remember, this is in a part of the country that has experienced, and still does experience lots of segregation and not great race relations, but for that period of time some other shared identity trumped their ethnicity. They weren't thinking of themselves sitting there as I'm white or I'm black or I'm, you know, pink or yellow or whatever. They were thinking about their relationship with, in that case, with God. MARTIN: That they're Army green. Prof. PUTNAM: ...at least some of the time. Prof. PUTNAM: Of course it is. MARTIN: ...the mega-church experience, the evangelical experience is a unique experience; it's something that people have to willingly choose. MARTIN: At least in this country, thankfully. Prof. PUTNAM: I think what we all need to do, all of us - in different - in our different, you know, walks of life, is to look for opportunities, at least part of the week in which for some period of time some shared value or shared identity trumps our racial or ethnic identity. MARTIN: You're right, it is crazy. It should be the Mets. Prof. PUTNAM: Well, what I'm trying to say, I'm using homely examples like churches and sports fields and work and so on, to indicate that I think there are things that public policy can do. I think, for example, that we ought to be doing a lot more to help local communities who are struggling with rapid increases in diversity. That's the parts of America where, you know, there's a rapid raid of increased immigration. I don't think the issue is how to get rid of those immigrants. I think the issue is to have national help to those communities in adjusting to that change. I think there are things we can do in our schools to emphasize shared values. I think there are things that we can do in our, as I say, in our churches, in our playing fields, in our work places. I'm actually quite confident that over the long run we'll grapple with this problem. Actually, my daughter is married to a Costa Rican immigrant. I have therefore three grandchildren that are kind of mixed race and they certainly are bringing - my son-in-law and those kids are bringing enormous wealth to the United States. I don't physical, financial wealth; I mean cultural wealth to the United States. I just hope we fix this problem before my granddaughter is getting Social Security. MARTIN: Robert Putnam is a political scientist at Harvard University. He joined us from New Hampshire Public Radio in Concorde. Professor Putnam, thank you so much for speaking with us. Prof. PUTNAM: Great pleasure, Michel. Thanks a lot.